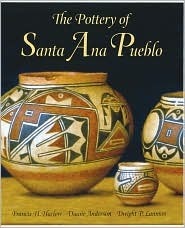 When given the opportunity in 2005 to review The Pottery of Santa Ana Pueblo for the book review periodical Southwest BookViews I asked myself, as a researcher and collector of American Indian pottery, why Santa Ana warranted a detailed and exhaustive study of its pottery production. After all, Santa Ana has produced very little pottery in the last century and is not very well known to the general public. But after reexamining the 2003 release of The Pottery of Zia Pueblo by Harlow and Lanmon (published by School of American Research Press) I found this most recent volume could easily be considered the continuation of that earlier work.The necessity in analyzing wares from Santa Ana lies in the fact that the pottery of both pueblos, at least until about 1760, so closely resembles each other as to be nearly indistinguishable. Thus, to accurately define pottery from Zia (which has always been a prolific village) it is also necessary to define that of Santa Ana.In the course of their research the authors say they were able to "(d)escribe the chronological sequence of forms and designs based on evidence that has not previously been utilized." To that end they trace the evolution of Santa Ana pottery from its early roots with a discussion of Puname pottery styles (c. 1450-1760) to the first pottery style identifiable at Santa Ana Pueblo (c. 1760) up to the end of pottery making for local use at the village (c. 1925), and through various revivals up to the present.Pottery from museums around the world was examined and 300 vessels (more or less) have been illustrated in color, making this volume exceedingly thorough in scope and of enormous benefit to researchers and museum personnel. Organized chronologically, well over half the text appears to be intended for researchers and archaeologists, since collectors have limited access to pre-1880 pieces. The last two chapters will interest collectors most, because during the technical discussions of paste, temper and form (as well as at the rather monotonous litanies of design elements of each illustrated piece) the average collector's eyes will likely glaze over. Yet this detailed analysis is critical to the understanding of the fundamental differences that define pottery by period, style and village of manufacture. Certainly the discussion of the ceremonial break and associated path line in Pueblo pottery is invaluable.The author's collective credentials are impeccable, and all are associated with the Museum of Indian Arts and Culture in Santa Fe; Harlow and Lanmon as Research Associates, Anderson as Director. Harlow, who is a physicist at the Los Alamos National Laboratory, is also one of the foremost authorities on pueblo pottery and has written or collaborated on more than half a dozen publications about Southwest Native American pottery. Anderson wrote All That Glitters (published by SAR Press in 1999) about micaceous pueblo pottery, and Lanmon authored When Rain Gods Reigned for Museum of New Mexico Press in 2002 (SBV Vol. 2/2).The result is a nicely produced, large format hardcover with glossy pages and color photos; a beautiful-and informative-book that should become a foundation in any library, public or private, about Southwest Native American art. It is hoped the series will continue to encompass every pottery-making village or tribe in New Mexico and Arizona.